After such a good experience with the Tropic Travel Essentials, I barely hesitated before accepting Tropic‘s offer to review their Aftersun*(v) while I was away in Portugal. As someone with extremely pale skin there’s always a chance that I’ll get burnt when I’m in the sun, even though I’m fanatical about applying sun protection. Knowing I had something with me in case I ended up looking like a lobster was a huge help. Aftersun is a white lotion which has the lovely, herbal smell that I’ve come to associate with Tropic products — fresh, earthy, and natural. Normally my male friends are completely oblivious to anything beauty-related but they commented on how much they liked the scent, and some of them even borrowed the lotion to use themselves while we were on holiday. High praise. Often I find that aftersuns have a tingly, short-term cooling effect and then end up drying my skin out but this is the opposite, in that it feels like a normal lotion at first and then it gets cool as you rub it into the skin. Tropic Aftersun contains aloe vera (a natural conditioner), eucalyptus (a natural pain reliever) and calendula (which is antibacterial), all ingredients with useful properties in this situation. The most interesting thing about the aftersun is the texture — I wouldn’t describe it as light, exactly, but it’s not heavy either and it’s very hydrating. It sinks in pretty quickly too, soothing skin and providing some much-needed relief for sun-kissed shoulders. So, would I buy it? Truthfully, I can’t see myself splashing out £16 — it’s a bit much for something I would only use for a few months (or even weeks) of the year. However, I do love it and would recommend it to those who have a bigger budget than mine. 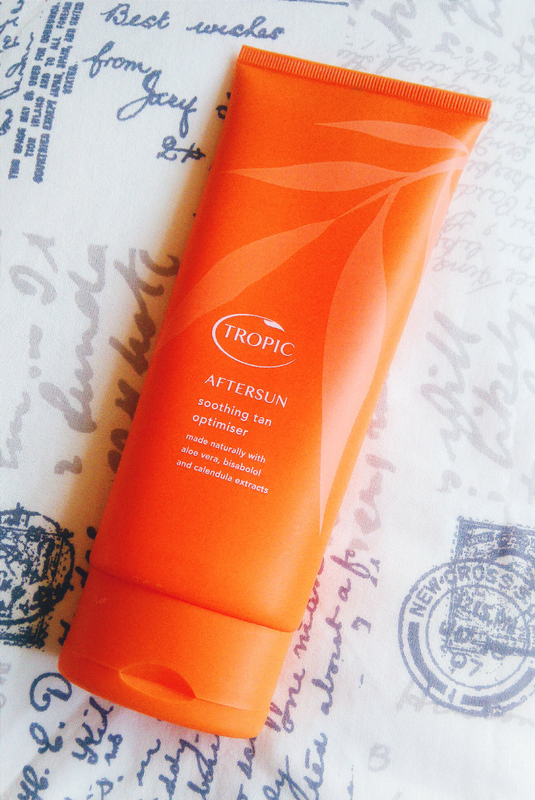 Tropic Aftersun is available on the Tropic website and costs £16 for 200ml. What do you like to use as an aftersun? Have you tried this before? Let me know in the comments!